CHARLESTON, S.C. (CNS) — Bishop Robert E. Guglielmone of Charleston asked for prayers for the families of those killed as well as for those whose homes were destroyed in what officials called a 1,000-year storm that brought extreme rains that deluged South Carolina. Authorities said at least 14 people died and media reported that rescuers have had to pluck hundreds from swamped cars and flooded houses. Some residents remained in danger Oct. 6 from residual effects of saturated grounds that can unearth weakened trees and collapse roads. State officials declared a state of emergency Oct. 1 as unprecedented rains and flash flood conditions raged throughout the state. Bishop Guglielmone canceled the On Fire With Faith conference set for Oct. 2-3 in Simpsonville, 200 miles northwest of Charleston. Other diocesan events were postponed and rescheduled. 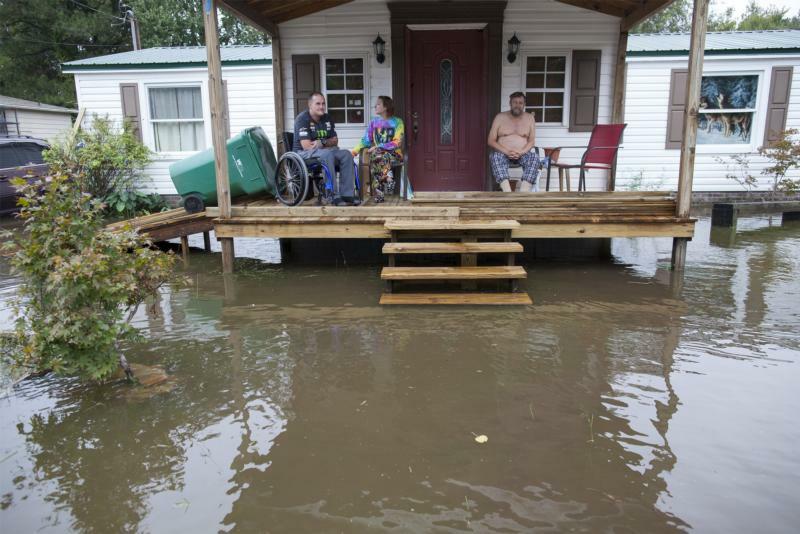 The National Weather Service reported that from Oct. 1 to Oct. 5, Charleston saw 23.61 inches of rain, while nearby Summerville, which also had significant flooding and evacuations, was inundated by 19.47 inches. Columbia Airport had 10.77 inches. It was the dams in Columbia, however, that wrought more damage. The South Carolina Emergency Management Division reported that of 18 dams officials are closely monitoring, nine have breached or failed completely and one was intentionally breached to relieve pressure on it. The dams are part of the 70-mile network of lakes and streams that make up the Gills Creek Watershed. The emergency management division also reported that several rivers remained above flood stage Oct. 6. Mandatory evacuations were ordered for some areas and a curfew was mandated by Charleston officials. Msgr. Richard Harris, diocesan vicar general, is pastor of St. Joseph Church located near one of the flooded areas along Lake Katherine in Columbia. The church was without power and closed Oct. 4, so Masses were canceled. He said he knew of 10 parishioners who had to be rescued by boat. “They have lost everything,” Msgr. Harris said. One family had to put their children on their shoulders and carry them through chin-deep water, he added. Tracy Bates, Catholic Mutual’s claims risk manager for the Diocese of Charleston, had nine reports of damage from parishes as of the morning of Oct. 6 and that calls continued to come in. St. Mary Our Lady of Hope in Summerton southeast of Charleston was flooded with about 8 inches of water and remained submerged Oct. 6. Bates said water seeped into Blessed Sacrament School’s ground floor and the Carter-May Residence for assisted living also had water creep into its hallways. On the coastal peninsula, she received reports that Sacred Heart Church suffered flooding that submerged its basement boiler room, which houses the electrical system. Other parishes that have reported flooding and water damage include the lower chapel at the Cathedral of St. John the Baptist, Charleston Catholic School, Neighborhood House outreach center, St. Jude Church in Sumter’s youth center building, the library at St. Andrew Church in Myrtle Beach, St. John the Beloved in Summerville, and the rectory at St. Mary Our Lady of Ransom in Georgetown. Bates said crews have been in to dry out some of the structures as a first step. In addition to the bricks and mortar damage, the diocesan Office of Archives and Records Management was concerned about historically important items and put out a call to parishes to offer assistance with documents. “We’re happy to consult with vendors, help develop records recovery plans, find temporary housing for records, or make on-site visits,” said Brian Fahey, archivist. Bishop Guglielmone has sent a request to pastors asking them to take up a special collection within the next several weeks to help parishioners who lost their homes and churches that sustained damage. Mays is editor of The Catholic Miscellany, newspaper of the Diocese of Charleston.